Archadeck of Austin specializes in unique outdoor living space designs, but our most recent project in Central Austin certainly proves our range of versatility. 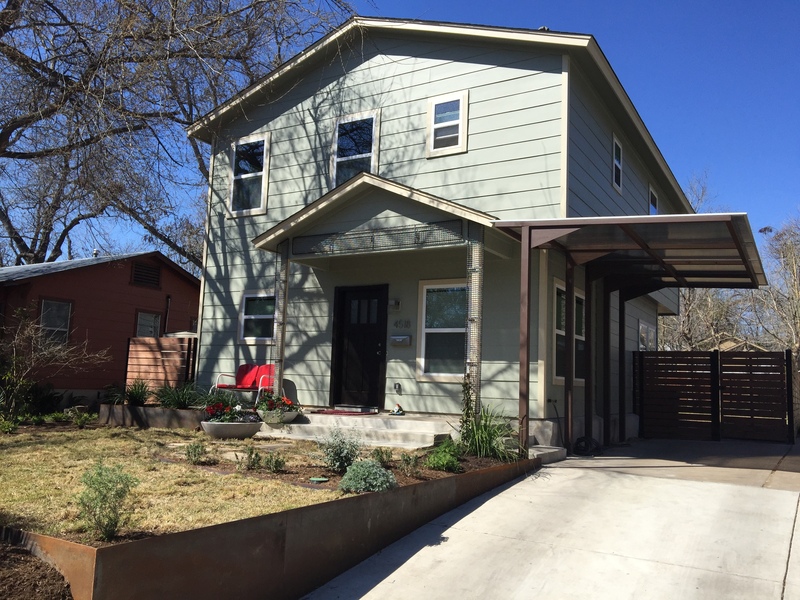 This project took place in the heart of Austin. The property encompasses a lot that originally contained a home built in the 1940’s. Though the original home was demolished and a new on built in its place, this property maintained two of the vintage walls from the original home. 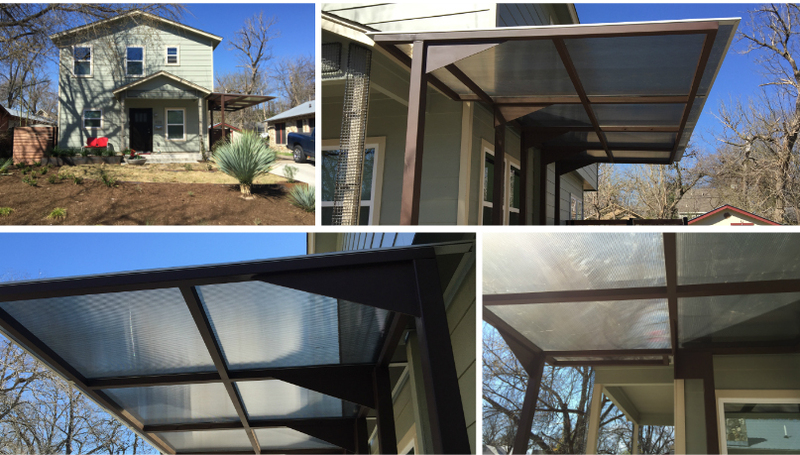 Archadeck of Austin was asked to design a privacy fence and overhead pergola that would not only serve as a porte-cochere but, also add upscale urban appeal to the home and landscape. This is a dualphased project and in keeping with our ability to design “out of the box” custom outdoor structures, we created a one-of-a-kind fence with the porte-cochere. The fence encases the entire rear part of the property to promote privacy within the urban setting and to allow plenty of room for the homeowner’s dogs to run and play. The design uses strong horizontal lines to convey a contemporary, masculine feel. 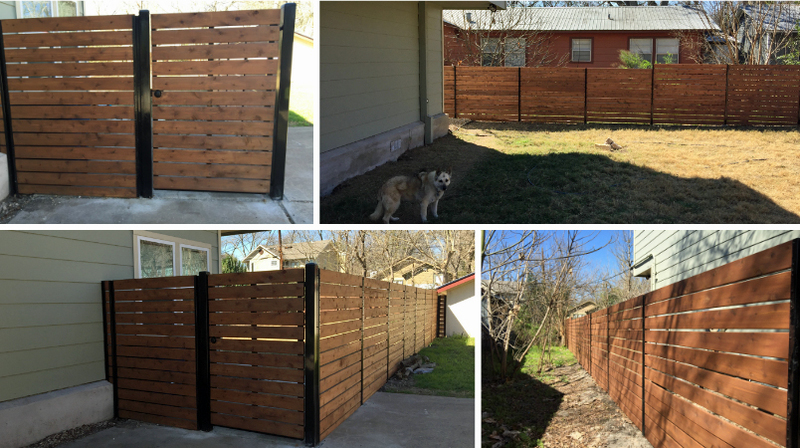 Archadeck of Austin installed thick cedar planks with Master Halco PostMaster Wooden Fence Posts, which are made from heavily galvanized restructured steel. The posts were then powder-coated black and a knob and keyed-lock was added to access the fenced area making it more secure. We also made the gate 4′ wide, for aesthetics and to allow better access into the backyard. Phase one of this project also included the stunning addition of the overhead pergola attached to the home. Built from 4 x 4 metal posts and metal arms elegantly supporting a Polygal cover. The impetus of the design was to provide the homeowner an entry that also doubles as a car port. By adding the Polygal cover we enhanced the functionality of the pergola by allowing sunlight in but providing protection from inclement weather. Archadeck of Austin also powder coated the steel used in the pergola’s design to mimic the look of vintage, rusted metal giving the addition the industrical-chic look and feel that is hot in today’s design. Phase two of the project is still a secret and should be built later this year. If you are interested in enhancing the beauty and versatility at your home and landscape, contact us today to discover how our custom, one-of-a-kind outdoor living designs can make it happen! You can reach us at ( 512) 259 – 8282 or email us at jim.odom@archadeck.net. This entry was posted on April 18, 2016 by austinporchandpatio. It was filed under Archadeck of Austin, Custom Privacy Fence Designs, Pergolas, Unique Outdoor Living Structures and was tagged with Archadeck of Austin, Austin Industrial Chic Outdoor Living Designs, Austin Outdoor Structures for Vintage Homes, Austin TX Unique Outdoor Living Designs, Central Austin Outdoor Living Space Designs, Central Austin TX Custom Privacy Fence, Central Austin TX Pergolas, Master Halco PostMaster Wooden Fence Posts, Polygal cover.